In just one year, Fitnet trainers have already enabled Fitnet clients to burn over 5 million calories of exercise! We’re excited to see how many millions more we can add to this total now that the critical-mass of smartphone users are within our reach. Fitnet, a top-rated comprehensive health and fitness mobile solution that utilizes biometric webcam sensors and human trainers to provide real-time feedback during video exercise, launched today for Android users. In addition to availability on Google Play, Fitnet is also announcing integration with Google’s Chromecast, allowing its subscribers to seamlessly access content on large screen displays, such as TVs. Fitnet already has users from over 200 countries, and by making its app available for Android, its workouts now reach over 95% of the smartphone market worldwide. Boasting added functionality, Fitnet’s new Chromecast integration broadens the apps’ real-time measurement capabilities. On the heels of its integration with Apple Health and Apple TV, Fitnet’s integration with Google Chromecast will transform more smartphones into wearable devices. Through this tool, Fitnet clients and trainers can obtain deeper measurements, such as calories burned, heart rate, stepcount and, on a large screen, during every workout. 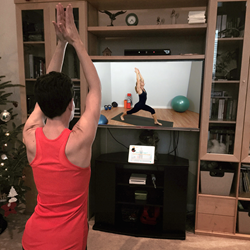 First introduced exclusively for the iPad in January 2014, Fitnet offers a free diverse library of yoga, cardio and strength training workouts that are customized by skill level and preference. In addition, the Fitnet global platform provides access for new clients seeking personalized and professional training and coaching from the convenience of a phone or tablet, anywhere, at any time. In less than one year, Fitnet clients from around the globe have collectively exercised more than 930,000 minutes . Fitnet closed $1.4 million in Series A Funding in April, led by Valleys' Ventures, LP and CIT Gap Funds. Fitnet technology has also earned third-party endorsements from TechCrunch, Mozilla, the National Science Federation, Microsoft, and Google, among other top technology influencers. The app is available now on a free download for the iPad, iPhone and Android with more than 250 workouts. Clients can also sign up with a certified Fitnet Fitness Trainer, starting at just $19.00/month. Launched in 2014, Fitnet delivers a personal fitness experience to mobile combining biometric sensors, fitness coaching and online workout buddies. Its unique technological approach converts a mobile webcam into a biometric sensor capable of scoring an individual while they work out with a human trainer. The Fitnet application is used in over 200 countries and its clients have collectively burned over 5 million calories since the launch on January 1, 2014. For more information, visit fit.net or follow @fitnethealth on Twitter.